Place all the ingredients into a high speed blender or food processor and blend until its reached your desired consistency. I left it chunky which was nice, but if you blended it till smooth it would be like a mousse! Whisk the egg whites till stiff peaks form. In a separate bowl whisk the yolks, cacao, brown rice syrup and vanilla powder. Carefully and slowly fold the yolk mixture into the egg whites. Try to keep as much air in the mixture as possible. 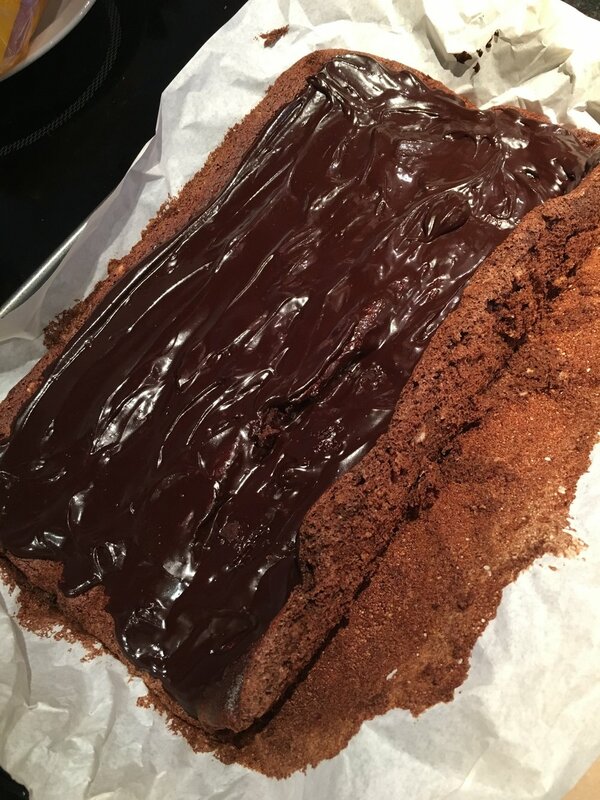 Line a baking tray with grease proof paper and pour the mixture onto the paper so it’s even. You want it to be about 2/3cm thick if possible. Place in the oven for 20min or until cooked. Roll the cake while it’s still hot (leaving the paper on for now). This will make it easier to roll when cool. Heat some water in a saucepan and place a large glass bowl on top to make a bain marie. Make sure the glass bowl isn’t touching the water below. The steam will be heating the glass bowl. Add the coconut oil, cacao (sieved if you don't want any clumps!) and maple syrup and stir until the coconut oil has fully melted and the whole mixture is smooth. Take the bowl off the heat and keep stirring. The mixture will get thicker as it cools. Drain and rinse the almonds then place into a blender with the cup of water, brown rice syrup and vanilla powder. Blend until the mixture is as smooth as you can get it. It should be thick and creamy! Unroll the cake. It should have cooled in the roll so will be curling up at the sides. Spread the ganache evenly on the inside of the cake. 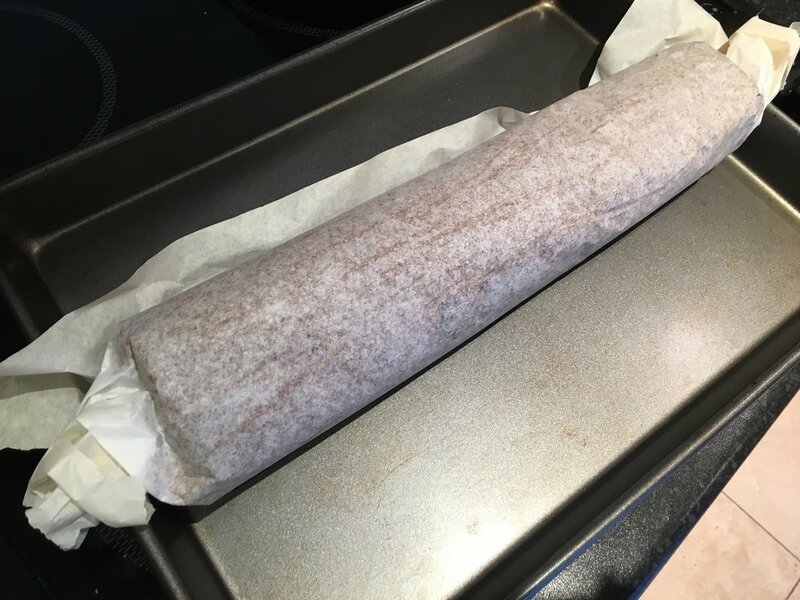 Gently roll the cake back up, carefully taking the grease proof paper off at the same time. Once rolled, spread the almond cream all over the top and sides. Sprinkle with some cacao and/or coconut flour. Decorate with some santas, snowmen, christmas trees etc! I wanted to do this but didn’t have any!! NB. You could put the almond cream inside the log and the ganache over the top. I think this would be just as good, plus you would then be able to see the swirls of the roll much better because of the brown/white contrast. Place the coconut oil, sweetener, dates and vanilla bean powder into a saucepan and heat until the dates begin to dissolve into the mixture. Using the back of a spoon, try to break them down (they don’t have to completely dissolve). Add in the nuts and oats to the saucepan and take it off the heat. Mix it all together so the oats are fully coated. Place the mixture into a dish and place in the oven for 10min or until it starts to turn golden on top. Place the walnuts into a food processor and blend until finely ground. Add the cacao and pulse to combine. Add the dates one at a time through the feed tube of the processor while it’s running. You should eventually end up with a mix that looks like crumbs. Add the almonds and pulse to roughly chop them. Transfer the mixture into a dish and press down so the mixture sticks together. Place into the fridge or freezer until ready to serve. Simmer the whole oranges in a saucepan of water for 1 hour. Cut the oranges in half and remove the pips. Blend the oranges in a food processer with the egg yolks. Mix the ground almonds with the xylitol and add in the egg yolk-orange mixture. Whisk the egg white until stiff, and fold into the mixture. Line a cake tin with grease proof paper, then pour in the mixture. Bake for 1 hour at 180’C or until the testing knife comes out clean. Place all of the base ingredients into a food processor and process until it will bind together. Tip the base into a lined cake tin and press down with a spoon (or fingers). Place all the filling ingredients into the food processor and process until smooth. Taste and add more honey if needed. Empty the filling on top of the base and ideally freeze (I didn’t have enough room in the freezer, so just put it in the fridge. It wasn’t set, but more mousse like). Take it out of the freezer 30 min before you want to eat it. Whiz together until the mixture clumps together into a ball. Using a teaspoon, make little truffle sized balls. Place them onto a plate and using a sieve,dust with cacao. Using 2 spoons (or your hands!) scoop a spoon sized amount out of the bowl and shape into balls. Place onto the greaseproof paper and flatten with the back of the spoon. Bake for about 15min or until they have a slight colour. Preheat the oven to 180 degrees and cover a cake tin with greaseproof paper. Place the nuts and seeds in the food processor and blitz until they’re flour like. Slowly add the dates a few at a time until everything’s mixd together. Then add all the other ingredients and blitz for a minute or two (you may need to scrap down the sides. Transfer the cake mixture into the tin and bake for about an hour. Let the cake cool and either eat as it is, or dust with coconut flour and top with berries. To make the base layer place the pecans and almonds into a food processor and blitz until fine. Add the almond butter, honey and dates and blitz again until completely mixed and sticking together. Either place in individual glasses or in a cake tin, both work fine, but I think it’d nice to give people individual dishes. Plus, you can see all the layers which looks great! To make the banana and almond layer, simply add the banana and almond butter to the food processor and blitz until smooth. Spoon this on top of the base and place in the freezer for about 15min to set. While the bottom two layers freeze you can make the chocolate layer. Place all the ingredients in the food processor and blend until smooth. Slice the bananas for layering. Remove the glasses/cake tin from the freezer anyplace a layer of banana on top. Then spoon on the chocolate layer. Add another layer of banana to top it off. You could also add some strawberries which is also delicious. Preheat the oven to 180 degrees and line a regular sized cake tin (a larger tin would create a thinner cake and will take less time to cook) with grease proof paper, or grease with butter/coconut oil. Place the coconut oil or butter, coconut sugar and honey in a food processor and mix until smooth. Keep the food processor going and slowly add the flour, baking powder, vanilla and eggs. Transfer the mixture to a large bowl and fold in the strawberries. Pour the cake mixture into the cake tin and place in the oven for about 40 minutes. Check it is cooked by piecing with a knife or metal skewer. If it comes out clean, it is cooked. This is lovely served with coconut yoghurt or homemade banana ice cream. Pre-heat the oven to 180 degrees and line a baking tray with grease proof paper. Place all the ingredients (except the chocolate) in a food processor and process until smooth. Add the squares of chocolate and pulse until they are broken down into small pieces. Using a teaspoon, spoon the mixture into even cookie shapes onto the baking tray. Place in the oven for about 15-20min. Top with berries and cinnamon if using and leave to soak for a minimum of 10min. You can make this the night before and have it for breakfast or dessert.